In the Sprint 147 Update of Azure DevOps, we have updated the various artifacts-related Pipelines tasks to support proxies. With this update, proxies now work in the npm, NuGet, .NET Core, and Universal Packages tasks. Check out the Features list below for more. In order to enhance the work item mentioning experience, we’ve added more information when you link a work item using #ID. You will now see in the discussion section the status of the work item you linked in addition to the ID, title, and work item type. This experience can also be used in Wiki pages as described here, as well as in pull request comments. For more details, see the documentation on using #ID to link to work items here. Today, when viewing file changes in a pull request, you can use either a Side-by-side diff or Inline diff mode. We have received feedback that many of you just want to see the original file or the changed file, without comparing them. So we added a new option that will allow you to view either the left file or the right file individually. Deleting unused release pipelines helps to keep the release pipeline list clean but sometimes you delete something by mistake. With this update, it's now possible to restore a release pipeline that was deleted within the last 30 days. We added a new tab to the left panel of the Releases page that will display a list of deleted release pipelines. From this view you can restore a deleted release pipeline by selecting the pipeline from the list and clicking the Restore button. While creating a pipeline, Azure Pipelines will optionally commit a YAML file to your repository and then create a pull request for the pipeline. Previously, if the repository was on GitHub and you had the Azure Pipelines GitHub App installed, the commit and pull request appeared to be created by the GitHub App: "Azure Pipelines [bot]". With this update, we will show your GitHub identity as the creator of the pipeline instead of the GitHub App. Currently, Azure Pipelines will detect and automatically use an existing YAML file named azure-pipelines.yml or .azure-pipelines.yml at the root of your repository in the default branch when creating a new pipeline. With this update, you can choose an existing Azure Pipelines YAML file with a different name or path, or in a non-default branch. To select an existing file, from the New build pipeline wizard configuration page select Existing Azure Pipelines YAML file. Then, choose the branch and browse to select the YAML file path. With this update, you can run a pipeline or test suite to validate a GitHub pull request from the comments section of that PR. Any owner or collaborator can comment on a pull request with /AzurePipelines run or /AzurePipelines run <pipeline_name> to trigger a build. You can also abbreviate the /AzurePipelines moniker as /azp. For more details on this feature type /azp help in the comment. It's a good practice to protect the quality of a branch by implementing pull request validation builds. Until now, those validation builds were triggered automatically by any GitHub pull request, which could be risky since the build would start without your review. With this update, you can require pull request validation builds to be authorized by your team. To do so, select the Triggers tab in your pipeline's settings. Then, under Pull request validation, enable Only trigger builds for collaborators' pull request comments and save the pipeline. Now, pull request validation builds will not be triggered automatically. Any repository owner or contributor can trigger a validation build by commenting on the pull request with /AzurePipelines run or /AzurePipelines run <pipeline_name>. Until now, there was a limitation that prevented uploading build artifacts with paths longer than 233 characters. This could prevent you from uploading code coverage results from Linux and macOS builds with file paths longer than the limit. With this update, we've extended the limit to support long paths. This sprint, we've continued to make the extension framework more powerful by adding two new contribution points in the Test Results tab in Pipelines. This will enable Marketplace extensions to provide more tailored reporting experiences and add further interactivity. Sometimes you may want to perform an action like updating an API's data or running custom tools using metadata from your test results. With this contribution point, you can create extensions which use the immediate context of the selected test result to add a custom action to the *Custom Action- button. You may have a wide variety of test report consumption workflows and may want to see different data points against failed tests for debugging and analysis. By using this contribution point, your team can add a new tab to the details pane that will come up when you select the any test result row in the data grid. This new tab can show a view with static content or dynamic data fetched using internal or external APIs. npm Authenticate, Pip Authenticate, Twine Upload Authenticate > [!NOTE] > These tasks do not configure the proxy for the underlying tool (npm, pip, twine). They support proxies during the acquisition of auth tokens, but it is still necessary to configure any subsequent tasks/scripts/tools to also use the proxy. In Azure Artifacts, Project Collection Administrators (PCAs) have always been able to administer all feeds in an Azure DevOps organization. With this update, PCAs can also give this ability to other users and groups, thus delegating the ability to manage any feed. The Test result trend (Advanced) widget is now available for those who have installed the Analytics Extension on their Azure DevOps organization. It provides near real-time visibility into your test data for multiple builds and releases. 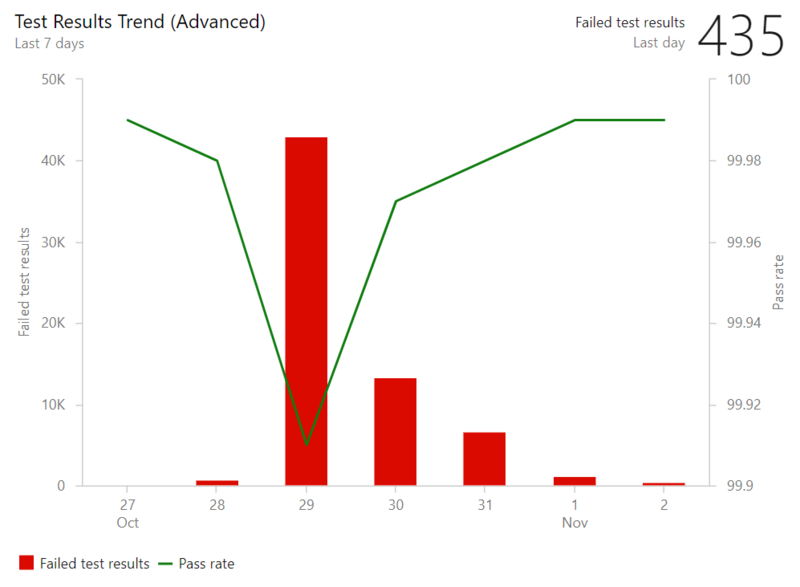 The Test result trend (Advanced) widget displays a trend of your test results for your pipelines or across pipelines. You can use it to track the daily count of test, pass rate, and test duration. Tracking test quality over time and improving test collateral is key to maintaining a healthy DevOps pipeline. The Test result trend (Advanced) widget helps you find outliers in your test results and answer questions like: are tests taking longer to run than usual? What test file or pipeline is affecting my overall pass rate? What are my long running tests? The widget is highly configurable allowing you to use it for a wide variety of scenarios. Until now, shared Wiki page links broke if the linked page was renamed or moved. With this update, we've introduced permanent links by adding a page IDs to the URL. This ensures that links you share remain intact as the wiki changes over time. This feature was prioritized based on this suggestion ticket. In this update, we've enhanced work item mentions in Wiki pages by adding the status of the work item to the page, along with its ID and title. Work item references in Pull Request comments and Boards discussions will also show the status. This feature was prioritized based on this suggestion. With this sprint all users have been moved to the New Navigation. We’ve removed the preview feature toggle that allowed users to return to the previous navigation model. To learn more about navigating in the web portal, see Web portal navigation in Azure DevOps. These features will roll out over the next two to three weeks. Head over to Azure DevOps and take a look. We would love to hear what you think about these features. 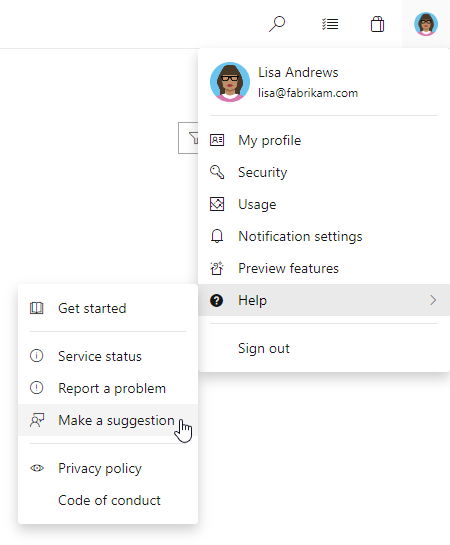 Use the feedback menu to report a problem or provide a suggestion.